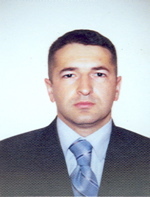 Siraj Mahmudov was a Muskie Fellow in the Policy Center from 2000-2002. Upon graduating he took a position as a program planning officer for UNICEF's Azerbaijan Office. "The program offered by the Graduate Center for Social and Public Policy not only helped me find my current job, but also equipped me with the right knowledge and skills to perform this job effectively. I work on policy development, planning, monitoring and evaluation at UNICEF. My courses and involvement in the outreach activities of the Center provided me with the tools and knowledge that can be applied in any given country and are pertinent to policy makers."